When one thinks about Christmas decorations and Christmas presents, pottery is perhaps not the first image that springs into mind. 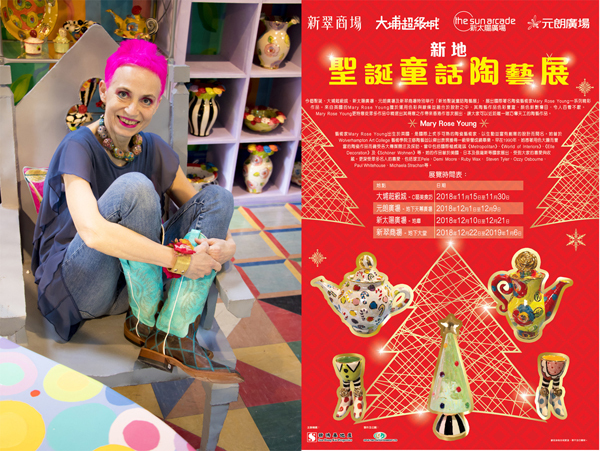 But Mary Rose Young’s colourful fantasy style is perfect for the Festive Season. The child like sense of wonder and excitement, the warm glowing colours to light a united family around a sumptuous table, and above all the sheer sense of celebration. This year Mary Rose has added a series of Christmas Baubles to her range of beautiful hand made pottery to join the Christmas Trees and Candy Cane Mugs. There is also a specially created collection of smaller vases and bowls in newer designs and styles which will make wonderful Christmas Gifts. No Christmas season is complete without a visit to her gallery even if you only take away inspiration for your own Yuletide Interior Design. Starts Saturday November 26th 11am and then continues every day until Thursday 22nd. Sending pottery to China may sound a little like sending coal to Newcastle…. I expect China makes most of the ceramic production of the whole world these days. Yet it seems they need some Mary Rose Young. 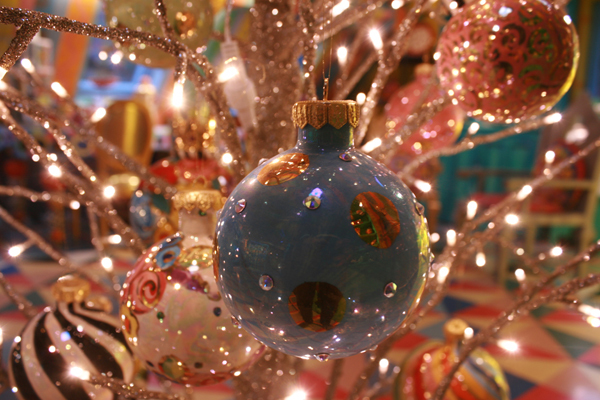 The order was from a company that make decorations for Shopping Malls…. they provide decorative models to place on visible walls and staircases and then they organise a central display area, a little like an exhibition. They have selected a lot of Mary Rose pieces which have an air of the “Fairy Tale” about them. 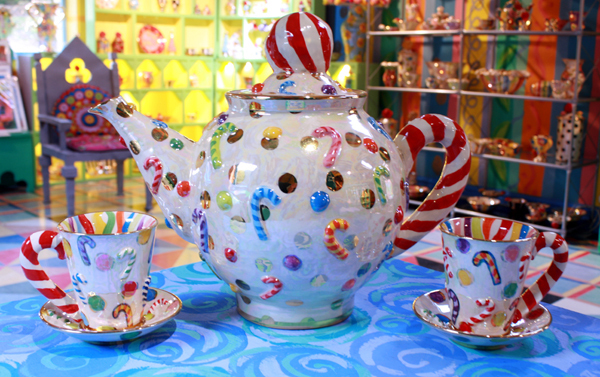 A Rose Encrusted Shoe, some Alice in Wonderland Tea Set pieces, and a Large Candy Cane Teapot. They are also very interested in Pig Encrusted pieces so perhaps that’s the motif of the next Chinese Year? As you can see from the poster there are to be 3 seperate cities that the exhibition shows in.... if you're in China you'll be able to read it, if you're planning a visit get it translated and go!! Mary Rose Young will feature in the main Gift Shop at The Biltmore from January 2019!! If you’re American you’ll probably know all about The Biltmore, if not it’s the great American period mansion with thousands of sight seeing visitors prowling around its rooms, gardens and parks every day. 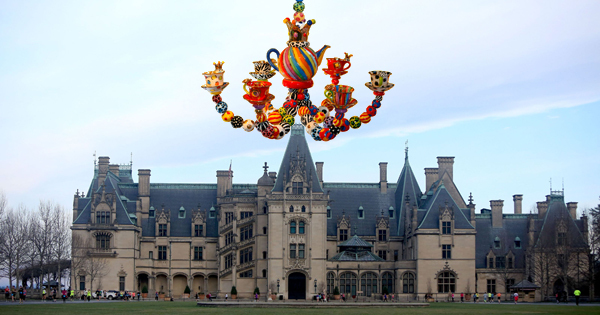 It was built by the Vanderbilts in Asheville North Carolina at the end of the Nineteen Century. Here in the UK we do have many such places of course but there's a difference... our Stately Home Gift Shops would be fairly rudimentary ….the Biltmore's is an Aladdin's Cave. And they haven’t just ordered a few vases…they've decided to set their collection off by placing the merchandise on a Mary Rose Glass Topped Table with a Giant 9 arm Chandelier hanging down from above. If you ever go to The Biltmore or are planning a trip don’t miss this Mary Rose Young display, it will be absolutely fabulous. One of Mary Rose’s first ever customers in London was the Department Store Harvey Nichols. She actually had a whole shop window dedicated to her work at the time (around 1990) which she travelled up to decorate herself. All department stores in those days were thought to be the absolute pinnacle of shopping as well as of supplying. Times seem to have changed and Mary Rose Young no longer supplies any department stores…..until this coming spring!.... Harvey Nichols are back and will offer as an Easter Gift a wonderful presentation box with luxury chocolate eggs and A Mary Rose Young Egg Cup. 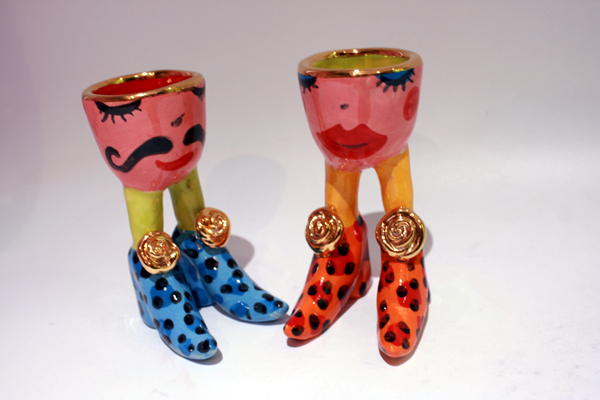 She created a range of samples for the visit of the buyer and was told that one theme may be “His and Hers”, so to that end she decorated this wonderful couple. Harvey Nichols’ final selection will be more floral. If you ever go to any of their stores look out for the box from the end of February. 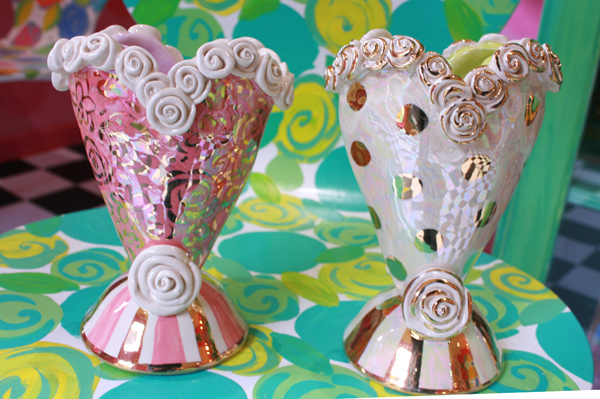 The Little Heart Vase that could be a gift! November 11th has passed us yet again. Our Young family were in fact very military right up until our own generation; there aren’t very many theatres of war that didn’t feature a Young or one of our “tributary families”. Our Great Grandfather was General Neil Douglas Findlay who was sent out to France at the beginning of the First World War even though he was already well into his fifties. He had fought in many campaigns already, notably Afganistan and South Africa, and his artllery expertise was highly valued. But the Total War on the Western Front was something else. 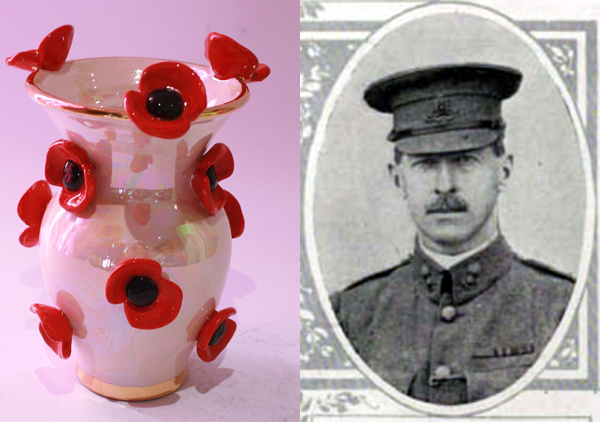 Neil Douglas Findlay was killed within days by a shell on September 10th 1914, and here he is next to a Poppy Vase fittingly made by his Great Granddaughter Mary Rose. Did he sacrifice himself for freedom? Or was he ordered out of his blissful family life by a government that saw men as pawns... what a relief that things are different now! Oak House, Arthurs Folly • Parkend, LYDNEY, GL154JQ • • Click here to unsubscribe.